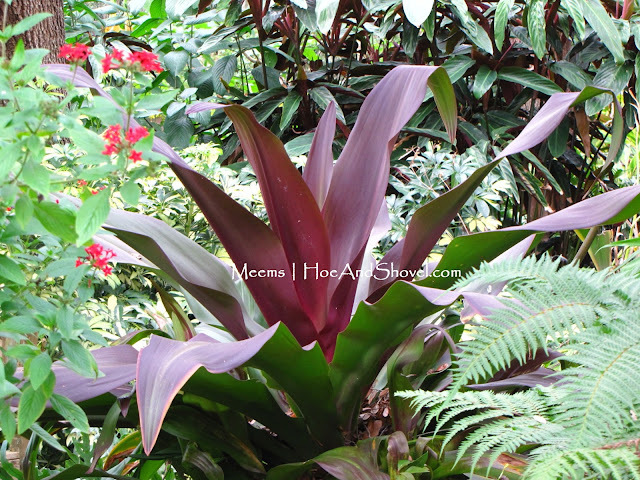 Cordyline terminalis or Ti plants, as they're commonly called, are winter bloomers ... mine are just starting to bloom. Ahhh... Florida winters. No need to wonder why so many folks flock to our lovely state in winter. If the calendar didn't tell me it was January, I'd think it was April! Unseasonably warm and mild weather has graced our spring-like winter so far. 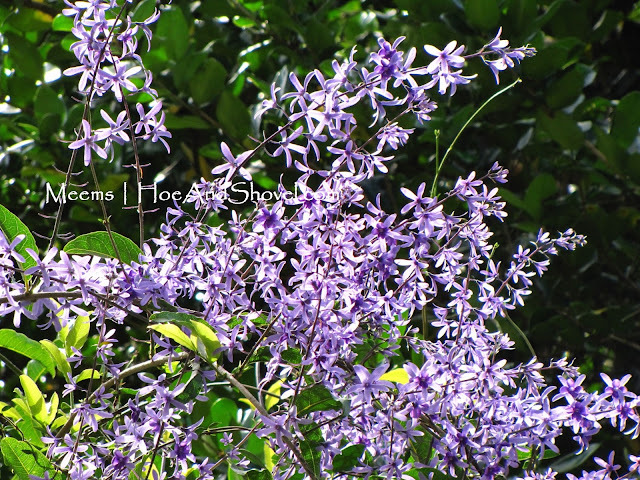 has exploded its luscious lavender cascading flower on the metal arbor in the back garden. When I look around my garden I see signs of new life and simultaneously I see signs of winter sleep. The gardener in me wants to trim and prune back as I notice decay. Then I give myself a good lecture about the dangers of prune-promoting growth. What if we do have a frost or freeze down the road? I'll let winter take its course and we'll wait to see just how many twists and turns, ups and downs it may make. Tiger Swallowtail butterfly on Pentas in January! Our dancing flower-friends are delighted by the abundant sunshine to warm their wings with our mild temperatures. 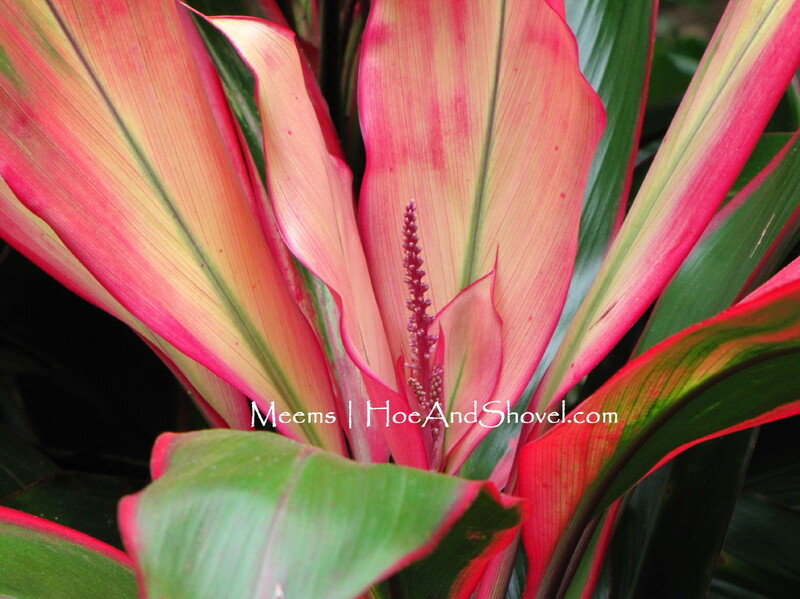 Plenty of leaves on their host plants keep them laying eggs and sufficient nectar from colorful flowers keep them sipping throughout this winter. White Peacock butterfly looks especially stunning while nectaring from Cosmos 'Bright Lights'. Cosmos planted from seed in late spring have not broken their cycle of flowering and reseeding since. 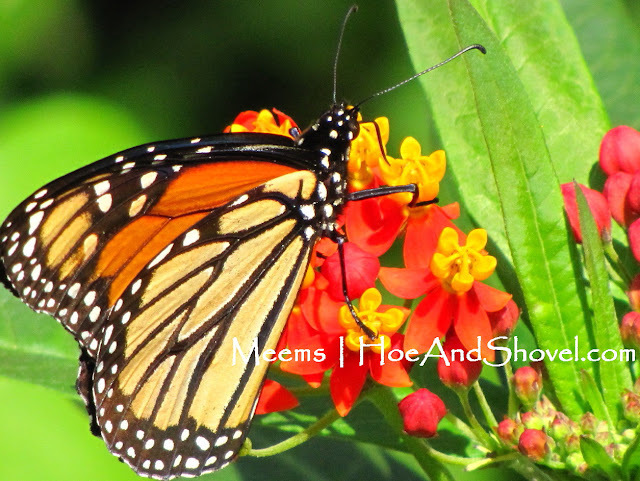 Milkweed (Asclepias) flowers serve up nectar for Monarch butterflies while the leaves and stems host Monarch larvae. Florida (some central but mostly south Florida) enjoys a population of non-migratory monarchs that live here year round. It's helpful that milkweed plants re-seed randomly all over the garden. There's never a lack of food or nectar for our flying friends. 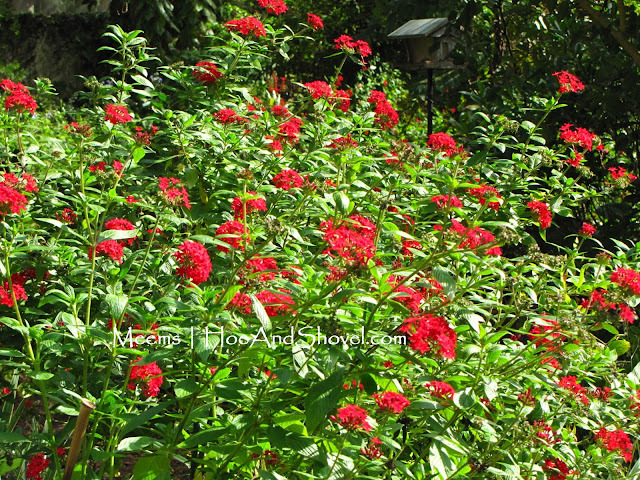 Favored by almost every pollinator, including our year-long, resident hummingbirds the long-tubular flower clusters of crimson red Pentas are populated with winged critters throughout the day. 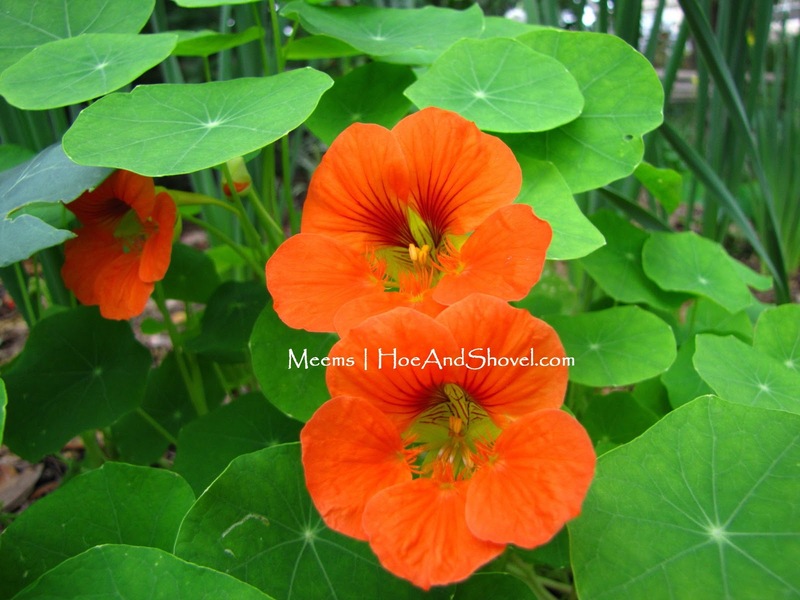 Plentiful supply of this practical Florida-Friendly perennial is purposely planted throughout my garden. I prefer the shrub-like variety that grows 4-5 feet tall and 3 feet wide. Mixing up cold-hardy plants (such as liriope, cast iron, agapanthus, walking irises) with shade-protected tropicals (such as bromeliads, xanadu, dwarf schefflera, shell ginger) and rhizomes (gingers) that go to sleep in winter ensures an evergreen pallet that carries my garden through every season. This winter 'Postman Joyner' Caladium bulbs planted in early November continue to produce their bright red foliage in January. This view from the sunny bed with mixed flowers and edibles through to the circle garden isn't as bright and perky as it will be in summer. I'm not wishing for one, but with a frost or freeze it would look a lot more barren. 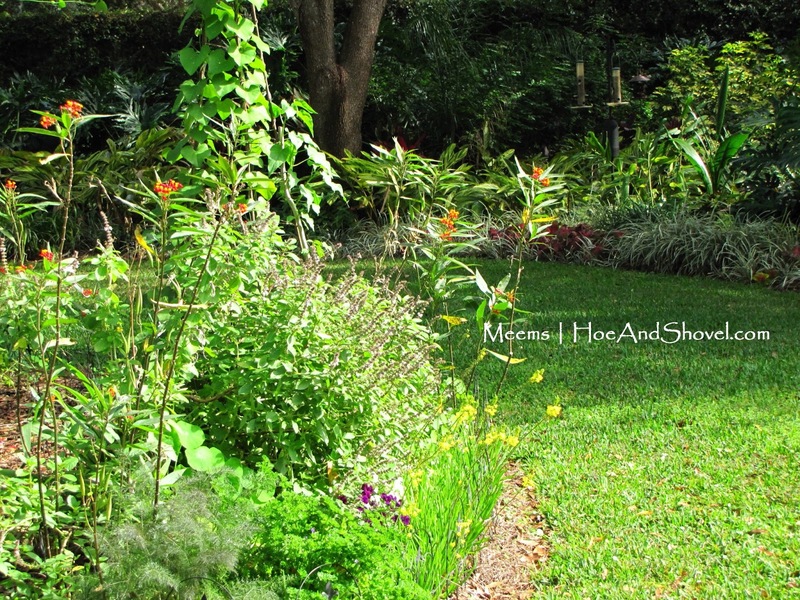 A side view of a mixed border of parsley, bronze fennel, self-seeding milkweed, yellow-flowering bulbine, violas, nasturtium, and African blue basil juts out in front of the woody and herbaceous perennial bed (mixed with Florida natives) behind it. A mixed group of Florida-Friendly plants crowds a rarely-seen back corner of my garden. 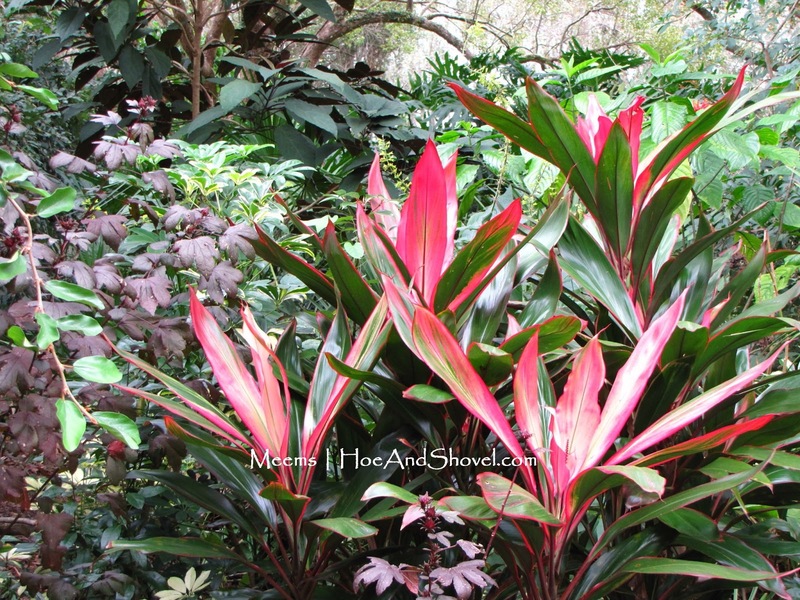 Cordyline plants turn from their green-pinkish variations to their most vibrant and brilliant colors as the winter wears on. Paperwhites, nasturtium, sweet alyssum, bulbine and a few broccoli starts blend in this mixed planting bed that juts out in front of a perennial grouping. Paperwhite bulbs are inter-planted in the same soil with caladium bulbs. 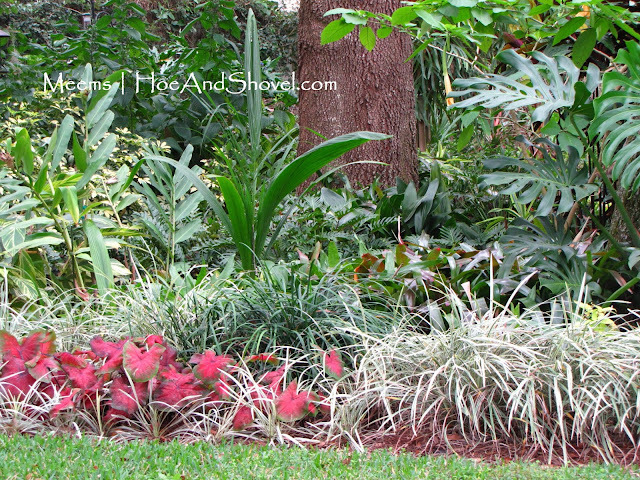 Two months ago this bed was filled with the bright, colorful foliage of 'Red Flash' and 'Peppermint' caladium. 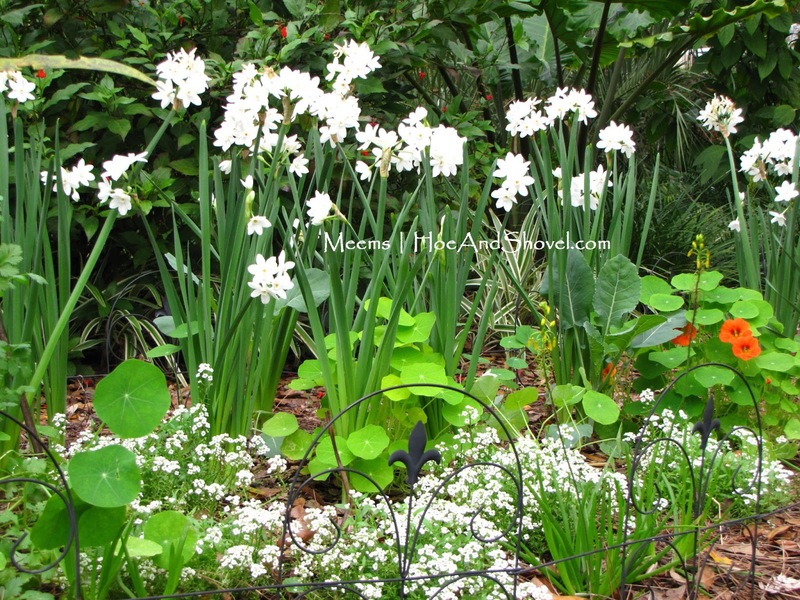 When my beloved caladiums retreat until spring, paperwhites spring out of the ground with fresh white winter flowers. Nasuturtium seeds planted randomly, sprout during cool temps, to create low-lying color among paperwhites, alyssum and yellow-flowering bulbine. Tropical lushness portrayed by the giant purple leaves of Queen Emma lily (Crinum Augustum) is prized in the winter scenery. 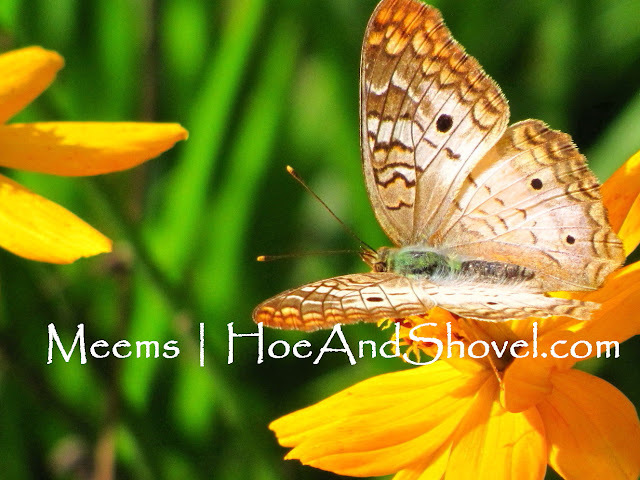 *** Hoe and Shovel on Facebook *** come see the daily plants/flowers photos and fun discussions. Click on the LIKE button under the header to be part of the conversation. Would love to hear what's going on in your garden. I almost cut back my rose bushes yesterday but then told myself if I did, we would definitely get a frost down the road. This beautiful weather makes me ansy to do something in the garden other than weed. What a great post Meems. 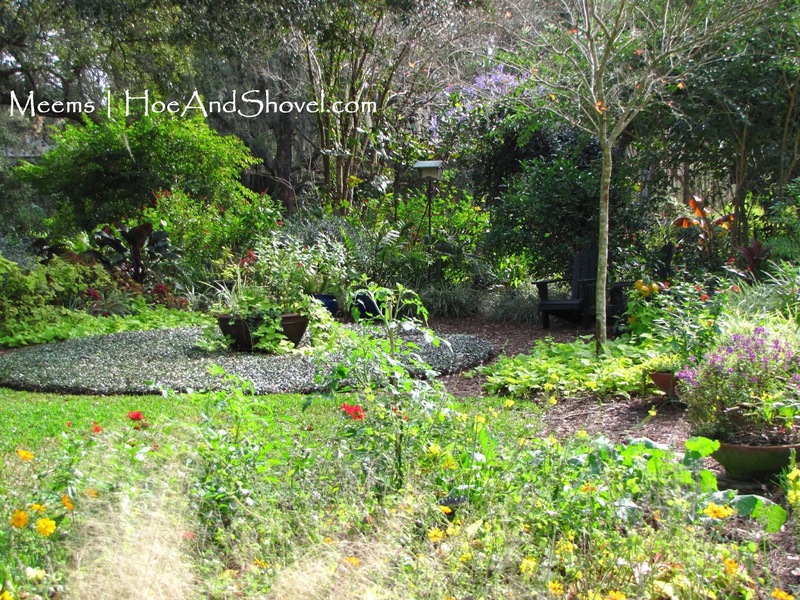 I love seeing all that is blooming there in your lovely gardens. Your new header is gorgeous! You have so much color in your garden. Thanks for the eye candy. Gosh, your butterfly pictures are just dazzling. And that queen's wreath vine--wow! I've never heard of it before, but it's beautiful. It's warm here too--too warm in my opinion. I'm hoping cooler weather returns soon. Meems, Your knowledge of Florida flowers, butterflies, birds etc. continues to inspire and amaze me. Gorgeous photography as usual. Oh you are giving me zone envy! Everything looks beautiful! It has been wonderfully warm this winter. I have to restrain myself from planting some new plants I've been wintering over in pots. Now if we can only make it through the next 6 weeks unscathed...wouldn't that be wonderful? Fantastic photos, i really love the Euphorbia milii. Its a cool although sunny day here in London so a great post for brightening up my day!! I plant the bulbs and leave them in the ground. Greenery sprouts back out of the ground some time in the fall... then the flowers later. Easy-peasy!